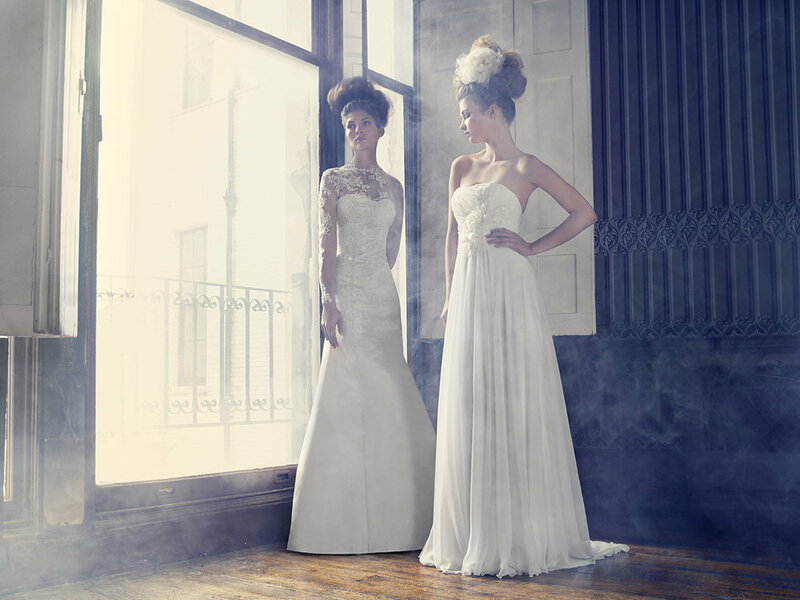 Elysian Metamorphosis — The Couture Gallery - wedding dress boutique in Kensington, London. Dazzling moonstone and crystal embellishments adorn and enhance the elegant pale blue silk satins. Voluminous floor sweeping tulle gowns make for a grand entrance whilst exuding romance and elegance. Body sculpting corsetry compliment the female silhouette and create the perfect hour glass figure. The incorporation of soft pastels such as blush, champagne and dusty blue brings a fresh dimension to the bridal palette of the modern couture bride. Rose-pink silk satins are overlaid with handcrafted French lace, in which thousands of delicate pearls and paillettes add subtle shine and glamour. Elaborate handcrafted silk flowers create dramatic focal points and draw the eye to the structure of the waist.